Denverites once enjoyed a retail landscape rich with personal touches. Revisit May-D&F's animated holiday windows or the ice skating rink in front of the store. Reminisce about the Christmas chandeliers that stretched for four hundred feet on the main floor of the Denver Dry Goods or the elegance of Neusteters, with its fashion shows and exclusive merchandise. Recall finding that perfect outfit at Fashion Bar and going back-to-school shopping at Joslins. Celebrate salespeople who remembered your name and the comforting feeling of shopping locally where your parents and grandparents shopped. 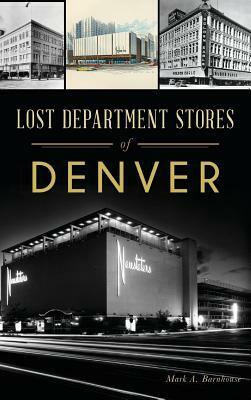 Through decades of research and interviews with former staff, Denver's unofficial "department store historian" Mark Barnhouse assembles the ultimate mosaic of the Mile High City's fabulous retail past.